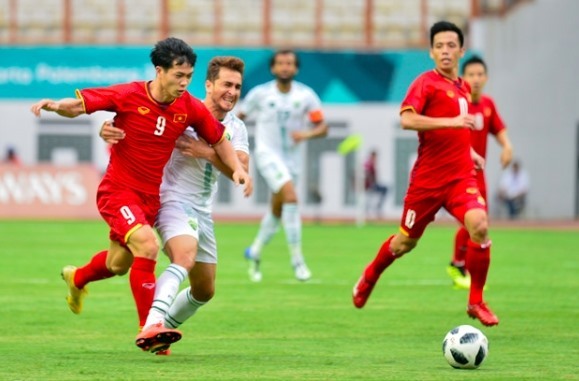 Việt Nam enjoyed a good start with a 3-0 win against Pakistan in the first match of Group D at the Asian Games (ASIAD) 2018 in Indonesia yesterday. Việt Nam controlled the game from the first whistle. Striker Nguyễn Văn Quyết had three early attempts but his efforts were either off the mark or saved by Pakistan’s goalkeeper Hanif Saqib. Midfielder Nguyễn Quang Hải scored the opener in the 21st minute before Quyết etched his name on the scoresheet four minutes before the break. Before the first half closed, the Vietnamese side had a chance to raise the score to 3-0 after being awarded a penalty kick, but striker Nguyễn Công Phượng’s shot hit the bar. In the 69th minute, Việt Nam were awarded another penalty after Mehdi Hassan was hauled up for rough play against striker Phượng who duly stepped up to take the spot kick. The penalty was saved by Saqib. However, in the 73rd minute, Phượng finally found the back of the net after receiving a spectacular pass to fix the score 3-0 for Việt Nam. Although Việt Nam opened their campaign with a convincing win over Pakistan, head coach Park Hang-seo said he wasn’t satisfied with the performance of his players. The South Korean coach said the opening match was often rather difficult, especially in a big event. There were many factors that affected the result. But Việt Nam still earned three points and go into the next game on a high. “I thought that the first match was very difficult and I was very glad that the whole team overcame that obstacle,” said Park. Meanwhile, head coach Jose Noguirra of Pakistan wasn’t too disappointed with his loss. Otherwise, he was glad as Pakistan returned after being banned from international football by FIFA for more than three years. Nogueira, who has more than 20 years of experience working in Brazil and Asian clubs including Nagoya Grampus Eight of Japan and Al-Ahli Saudi of Saudi Arabia, said Pakistan haven’t set any targets for the Asian event as his team had not played in international events for a long time. Nogueira said Pakistan football was in the process of rebuilding based on the U23 players in this tournament. The coach also congratulated Việt Nam for their opening win. He said that Việt Nam were stronger than Pakistan. His team played with all their hearts but they couldn’t score any goals. Next up, Vietnam face Nepal while Pakistan take on Japan on Thursday. The men’s football will finish on September 1. It will feature 26 teams in two groups of five and four groups of four. The top two teams from each group and the four best third-place teams will advance to the second round.